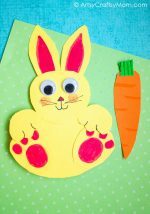 Bring together different craft supplies to make this mixed-media Recycled Plastic Egg Frog Craft! Perfect for learning about amphibians and aquatic animals. 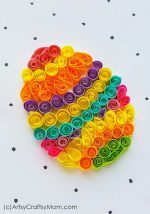 I love mixing different kinds of craft materials to make unique projects that don’t necessarily come under any category. After all, it’s the creative process that matters, right? 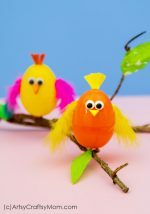 And don’t let the word ‘mixed-media’ scare you – it’s just a reference to using a collection of craft supplies, like we’ve done in this recycled plastic egg frog craft! 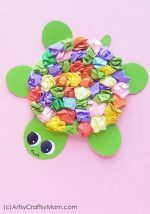 We’ve recycled a plastic egg and added some pom poms, googly eyes and craft paper to the mix to create an adorable little froggy! This craft can come in handy when teaching kids about aquatic animals or amphibians. Create a little frog habitat for the little guy to live in, and you have everything you need for a complete biology lesson! 1. Draw the outline of the frog’s legs and tongue on green and red craft paper respectively. You can also use pink instead of red. 3. Fix two small pieces of tack its on either side of the top of the plastic egg. Stick the pom poms on these tack its. 4. Glue the googly eyes on the pom poms. Use a black marker or Sharpie to draw other features on the frog’s face. 5. Use tack its to fix the tongue on the frog’s mouth and its legs by the side. Fold the inside edge of the legs and stick this part against the plastic egg. 6. The frog is ready! Now add a piece of tack it on the bottom of the egg so it can stand upright. Place it on any surface you like. 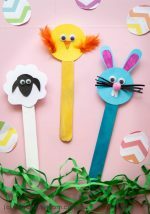 If you’d like to try more mixed media projects with plastic eggs, check out our plastic egg alien, plastic egg bird and plastic egg whale crafts. 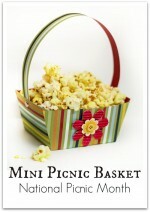 After making these, I’m sure the kids can come up with more ideas of such crafts!